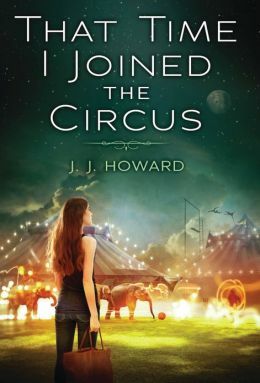 That Time I Joined the Circus by J.J. Howard was a thoughtful tale that makes you take stock of the things around you. Left with nothing, her father recently dead, her runaway mother being who-knows-where, Lexi is left with nothing but a bus ticket out of New York, a duffle bag’s worth of belongings, and word-of-mouth-hunch that her mother may or may not be with a traveling circus in Florida. When Lexi arrives at the Europa Circus in Florida and discovers her mother is not there, she is out of options. She has no money, no food, and no place to sleep. Taking pity on her, the Ringmaster offers Lexi a job, and crew quarters to sleep in. Having no one in the world to count on or talk to (her old best friends in New York abandoned her), Lexi has no choice but to make the best out of a completely crappy situation. Learning to break out of her shell , Lexi makes true friends, has a shot at love, and learns that the word “home” doesn’t necessarily mean a building or a particular place, but rather, it can mean being with the people you love, no matter where you are geographically. Told in back and forth present and past tense, this novel really makes you take a look at how you view and live life. Sometimes life is crappy, merely because we don’t have the guts to do anything to change it. And sometimes crappy things just happen, but how you react to it is entirely up to you. I give this insightful story four out of five stars.